UPDATE: This post has been updated since it was first published. Susan Forhan is the sole owner of Eastlake Massage, not a co-owner. As the saying goes, every journey of a thousand miles begins with a single step. For Eastlake’s business owners, that single step was a meeting Thursday morning at Cicchetti where the possibility of forming a merchants association was discussed. About a dozen businesspeople talked about the neighborhood, the business district and how an association might help them promote and improve it. Two Eastlake residents — Susan Kaufman, owner of Serafina and Cicchetti, and Susan Forhan, owner of Eastlake Massage — organized the meeting. Kaufman said she had tried to form a similar group 15 years ago, but the business district wasn’t ready for it and it eventually dissolved. She’s optimistic that the time is now right to form an Eastlake Merchants Association. Those present represented a variety of businesses, from restaurants to a dental office, a spa and two mail services, among others. 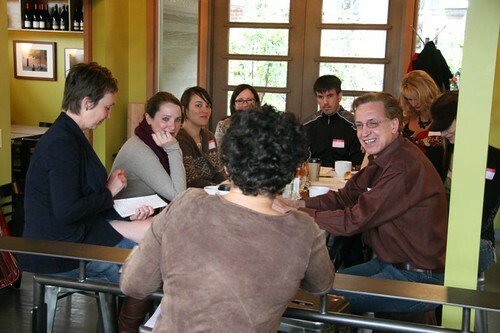 When Kaufman asked how people in the group perceived the business district, several agreed with Alcena Plum, owner of Louisa’s Bakery Cafe that it’s “a bit spread out.” While other neighborhood business districts are more compact, Eastlake’s runs from the University Bridge to roughly Zymogenetics, a long distance. It’s not easily walkable and that can make it hard to promote. “Alcena brought up a good point,” Kaufman said. “We’re disconnected by geography.” There are too many vacancies, she said, adding that people will walk if there are businesses to draw them along. Lori Herbert, from Aesthetica Contemporary Dentistry, felt that one problem was the businesses don’t know each other and neighbors often don’t know the businesses. “We’re our own best referrals,” she said. Other issues that make it challenging for local businesses are the fact that Eastlake is a busy street (it can be “intimidating,” one person said) and parking can be a challenge. On the plus side, the neighborhood is centrally located with good bus lines that make access easy. Kaufman noted that the challenges facing Eastlake businesses can seem “daunting,” especially because everyone has their business to run. She advised that the group “chip away” at things and not try to take on too much too fast. When she asked if the group felt like a merchants association was a good idea and if should they meet again, everyone said yes. The next meeting is tentatively set for 9 a.m. March 1 and each of those present was asked to recruit another business person to attend. This entry was posted in Uncategorized on January 28, 2010 by cdmilton. You can cover the distance by bike easily, or bus 70 runs every 15 min weekdays. It’s an electric, sometimes known as “pedestrian accelerator”. Maybe businesses could have bike or bus promos, give out Metro tickets or ORCA cards with $5 on them or something. I don’t think bikes and bus passes are workable solutions for eastlake businesses, and I don’t drive a car. There are three “retail cores” in Eastlake, separated by a lot of residential and commercial space. These areas are near the University Bridge, around Lynn street, and then down around Blaine and Garfield. Of these cores, the Blaine/Garfield area is the most underdeveloped. I think it makes sense to try to encourage [somehow] future development to concentrate retail in these three zones, so that people have places to walk to and create a more walkable community. That said, it is easy to forget how many businesses in eastlake are not “walk up” retail spaces. There are many businesses that are “drive up” and appointment focused. The common, larger problem that all these businesses and the community at large face is all the through traffic on Eastlake avenue. we can all work toward making Eastlake a better self contained, walkable community, as well as a destination for those outside – instead of a transit corridor for people trying to get to the university district or SLU/downtown by avoiding I5. I am relatively new to Eastlake. I really have enjoyed the coffee shops, bakeries and restaurants. However, it would be great to see more retail to make it feel walkable. A small but good grocery store would be fantastic:) (produce anyone?) Some cleanup of Eastlake to make it more pleasant – litter, overgrown vegetation in places, would help. Once I pass Serafina’s heading South, I just want to get to the lake because in between isn’t great. Is there a local group that volunteers to do occasional cleanup? I am often surprised the local businesses don’t even keep their own street fronts tidy and appealing. Of course, slowing down and/or reducing the pass through traffic would help immensely. A few more traffic lights might do the trick. Pedestrians trying to cross the street are often at risk.